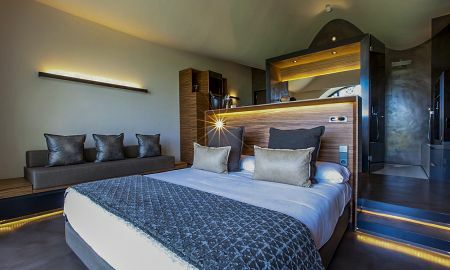 Cava & Hotel Mastinell is a spectacular 5 star hotel on the outskirts of Vilafranca del Penedes, near the vineyards of Mastinell. A modern design and grand architecture are the hallmark of this hotel. The structure has the shape of wine bottles stacked with style on a tile roof of gaudiano. The hotel was awarded the Gold Medal for best design Architecture in Shanghai in 2011. 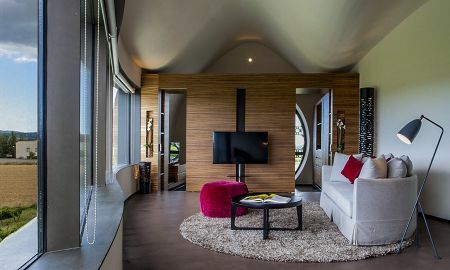 The rooms at the Cava & Hotel Mastinell have a modern style and resemble the inside of a bottle of wine, with circular windows with bubble shaped screens overlooking the vineyards. The Penedès hosts 95% of the total developed cava as it enjoys a typical Mediterranean climate very suitable for growing grapes. Mastinell Hotel is on the road to Sant Martí Vilafranca Sarroca (km 0.5). Vilafranca del Penedes is only 35 minutes from Barcelona Airport and well connected to the whole region. Some coastal towns are located just 10 minutes away from the hotel.